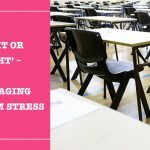 Now the Easter holiday has passed, the exams are around the corner it’s crunch time for your child, as they spend their last few weeks- maybe even days- getting ready for their exams. As a parent, you might be wondering whether there’s any more that can be done at this late stage? How do you handle a teenager who’s about to jump under a lot of pressure? Here we share some general advice and thoughts on helping your child as the ball really gets rolling! Firstly, now is a time to try and fuel your teen’s confidence. As much as some teenagers seem to be brimming with bravado, they will no doubt be feeling the pressure for what’s expected of them- and what’s expected of them is, quite frankly, a lot! Praise for areas where they seem to be succeeding or are likely to do well might give them the boost that they need to head towards these exams with a positive mind-set. It might also give some students a bit of focus, especially if there’s certain subjects they would like to do well in. However, with this in mind, it is important to remain realistic. You can help your teen by keeping conversations grounded. Rather than putting pressure on your child by saying that you ‘know’ or ‘want’ them to get a particular grade, phrasing such as, ‘It’s great you’ve worked hard on this subject,’ will be far more encouraging and beneficial at this late stage. For areas of weakness, or subjects where you teen is likely to struggle, you can say things such as: ‘Work on what you doknow.’ Also, although the ‘you can only do your best’ sentiment might seem clichéd, it can often be just what your teen needs to be reassured of as their exams close in! In terms of final revision, you might have a teen who has attended extra sessions at school or our Grade Booster course. In addition to this, your child may have spent many months now poring over notes and revision guides. There isn’t much ‘let up’ yet, but the last bits of revision should be well-focussed, carefully timed and productive. Don’t forget, a revision course will offer intense and specialised input, which can be the perfect way to ensure your teen receives great guidance! It’s likely your child might be getting a little weary or feeling like the whole process has been dragging on. It’s possibly more important than ever that they get proper rest times and some sort of routine, to get the most value out of the time that is spent revising. At this stage, revision can still be intensive, but spending every waking minute revising is probably going to do more bad than good! Students need proper breaks, nourishing rest and healthy diets, to give their bodies and minds the best chance of preserving energy for the exams ahead. You will, no doubt, want your child to be in good health for when they need to sit their exams. It’s OK to look out for them and it’s OK to look after them. Although examinations are all part of learning to grow up and turning into young adults, the best thing you can do for your child right now is be there for them in whatever ways you’re able!